Team Katusha's Kim Kirchen has emerged from a medically induced coma today, on what what would have been the fourth day doctors had stabilized him following cardic arrest late Friday evening. The Wort newspaper reported earlier today that the doctors at the University Hospital of Zurich had removed his breathing tubes and he his now successfully breathing on his own. Dr. Charles Delagardelle confirmed the switch elicited the first reaction from him, but was cautious at the time saying it will be "a few more days" before they can make any statements regarding his neurological state. 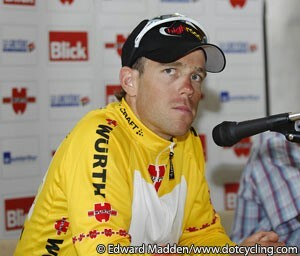 His Katusha team has just released a statement that said he recognized his wife and father immediately after waking up. "He asked what had happened because he doesn't remember anything," said the statement. "For the moment, he hasn't shown any cardiac or lung problems. He will have more tests to try and find out what caused the problem." Kirchen's wife is due to have twins this week, and the fact that he was breathing on his own this morning was welcome news, confirming that his brain was still able to control normal bodily functions. Had they taken the Luxembourger off of the respirator and he not been able to breath on his own it would have been a very bad sign. The president of Kirchen's fan club, Claude Scheuer, confirmed the collective sigh of relief to radio station DNR before news that he was awake broke: "The news we received today from Switzerland is reassuring . We all feel like a big load has been taken off our mind." His condition continued to improve during the day, and he is now conscious once again. We will provide an informative recap of the situation below with any further developments. Kirchen suffered from heart problems just before midnight in Switzerland on Friday evening. He was in his room with teammate Joaquim Rodriguez when he complained that he wasn't feeling well and collapsed. Rodriguez immediately got help from the team doctor Andrei Mikhailov and Marc Joseph, a family friend and retired firefighter, and they began to perform CPR. The details of the exact heart condition were sketchy at first, but now it appears that he suffered from a cardiac arrest rather than a heart attack. He was rushed to the University Hospital of Zurich and arrived there just after midnight. Doctors put Kirchen in a medically induced coma and lowered his body temperature to stabilize his medical condition, and improve his chances of recovery from the trauma. Just before the E3 Prijs Kirchen had trouble with an infected saddle sore. He went on a heavy dose of antibiotics, and ended up in the hospital after having a bad reaction to the medication. Doctors couldn't find any problems with Kirchen and sent him home. He was preparing to get back to racing in the Brabantse Pijl, but two days before the race he was found unconscious while out training and taken to the hospital by ambulance. Again, doctors were unable to diagnose the problem. During Flèche Wallonne he began experiencing problems on the first climb up the Mur de Huy. People close to Kirchen told the De Standaard that "his vision went black, and he suddenly didn't know where he was". For years there has been competitive division in Luxembourg when it comes to cycling. You either root for the Kirchens or you root for the Schlecks. The intense rivalry began decades ago with former professionals Johnny Schleck, the father of Saxo Bank's Andy and Fränk, and Jeng Kirchen, the brother of Kirchen's grandfather. The dedication of Fränk Schleck's Tour de Suisse win to Kirchen on Sunday underscores that their rivalry is one that is left on the road, and the Luxembourger will have both sides of the sport urging a speedy recovery on. A recent father, the situation is likely very personal for the older Schleck brother.